Background: Diabetes is disproportionally burdensome among African-Americans (AAs) and medication adherence is important for optimal outcomes. Limited studies have qualitatively examined reasons for nonadherence among AAs with type 2 diabetes, though AAs are less adherent to prescribed medications compared to whites. This study explored the reasons for medication nonadherence and adherence among AAs with type 2 diabetes and examined AAs’ perceived solutions for enhancing adherence. Methods: Forty AAs, age 45–60 years with type 2 diabetes for at least 1 year prior, taking at least one prescribed diabetes medication, participated in six semistructured 90-minute focus groups. Using a phenomenology qualitative approach, reasons for nonadherence and adherence, as well as participants’ perceived solutions for increasing adherence were explored. Qualitative content analysis was conducted. Results: AAs’ reasons for intentional nonadherence were associated with 1) their perception of medicines including concerns about medication side effects, as well as fear and frustration associated with taking medicines; 2) their perception of illness (disbelief of diabetes diagnosis); and 3) access to medicines and information resources. Participants reported taking their medicines because they valued being alive to perform their social and family roles, and their belief in the doctor’s recommendation and medication helpfulness. Participants provided solutions for enhancing adherence by focusing on the roles of health care providers, patients, and the church. AAs wanted provider counseling on the necessity of taking medicines and the consequences of not taking them, indicating the need for the AA community to support and teach self-advocacy in diabetes self-management, and the church to act as an advocate in ensuring medication use. Conclusion: Intentional reasons of AAs with type 2 diabetes for not taking their medicines were related to their perception of medicines and illness. Solutions for enhancing diabetes medication adherence among AAs should focus on the roles of providers, patients, and the church. Previous research has consistently reported racial differences in medication adherence.12–15 In fact, medication adherence is one of the major barriers minority populations face in achieving optimal diabetes care. Although suboptimal diabetes control is more prevalent among AAs compared to non-Hispanic whites,16 and medication adherence is an important self-care behavior needed for improved diabetes outcomes, limited studies have examined nonadherence among AAs with type 2 diabetes.1,14 Prior work has consistently shown that AAs are less adherent to prescribed medications compared to whites, even with equal access to medications.13,15,17 AAs are 25% less likely to adhere to their diabetes medicines compared to non-Hispanic whites18 and have worse adherence to their diabetes medicines, even after minimizing the variations in quality of care and insurance coverage.15,19–21 In a study by Schectman et al, AAs were less adherent to their medications and reported worse diabetes control compared to whites even when their medications were intensified.22 Shenolikar et al reported that AAs with type 2 diabetes had a 12% lower difference in adherence compared to whites.14 These findings show that there may be underlying reasons why AAs refuse to take their medicines, despite intensive clinical therapy and access to medications. Hence, an understanding of the reasons for medication nonadherence among AAs is critical to the development of tailored medication adherence interventions. Prior literature shows that not taking medications can be intentional because of patient-level factors or unintentional because of forgetfulness. Examining patient-level factors among AAs with type 2 diabetes is important because nonadherence due to illness and medication perceptions is reported to be a significant barrier to improved health outcomes among AAs with chronic conditions.30 It is known that patient reasons for medication nonadherence might vary among racial and ethnic groups because of culturally influenced perceptions of medications.30 For example, concerns about medicines are common among AAs and are related to medication nonadherence.31,32 In a systematic review of beliefs among AAs with hypertension, distrust of medications was prevalent and linked to patient beliefs about treatment and medication use.33 AAs are fearful of becoming addicted to medications and believe that medications are a symbol of illness compared to whites.30 Disbelief about disease diagnosis and medication side effects are also reported as reasons for intentional nonadherence among AA women with hypertension.34 Hill-Briggs et al noted that urban AAs with type 2 diabetes minimize the importance of medication in controlling their health.20 These culturally based perceptions may explain intentional nonadherence behaviors among AAs with type 2 diabetes.30 On the other hand, AAs have reported that they unintentionally do not adhere to their medications because they simply forgot.34 Prior studies have qualitatively examined AAs’ reasons for nonadherence in chronic conditions such as asthma and hypertension.35,36 To our knowledge, no study has qualitatively explored the intentional and unintentional reasons why AAs with type 2 diabetes may not take their medicines. Different interventions have been designed as a means of improving medication adherence among AAs including using motivational interviewing, reminder devices, automated phone call to deliver messages, and web-based programs. Few of these interventions have been effective.1 It is possible that there is a dissonance between what AAs believe would be helpful in improving adherence, and what is actually included in intervention designs. In one study of AA women with hypertension, participants reported that they take their medicines to live to see their children grow up and not develop disease complications.34 Exploring qualitatively what AAs see as motivations for medication use may help in developing tailored interventions that meet the needs of the community. To develop patient-centered adherence interventions, exploring patient views of ways to address adherence is paramount. Therefore, the study objective was to explore the reasons for medication nonadherence and adherence among AAs with type 2 diabetes, and understand their perceptions of the solutions for enhancing adherence. English-speaking AA adult men and women aged 45–60 years were recruited using purposive sampling. The inclusion criteria were self-identified AA/Blacks who spoke English, self-reported diagnosis of type 2 diabetes by a health care provider at least 1 year prior to the time of the study and reported taking at least one diabetes medication by mouth. Individuals who were younger than 45 years or older than 60 years, were not diagnosed with type 2 diabetes at least 1 year prior, and were using only injectable diabetes medications were excluded. The study was conducted from September 2016 to January 2017 and was reviewed and approved by the University of Wisconsin-Madison Health Sciences Institutional Review Board. Study participants were recruited in different community locations in two cities in a Midwestern State (Suburbs and Urban City) including a senior center, a church, apartment buildings, and a federally qualified community health center. The locations were selected based on the recommendations of the community advisory board. Key community leaders within the community locations and members of AA community advisory boards and community networks facilitated the recruitment of patients using word of mouth and flyers. Six semistructured focus groups were conducted in private locations in two different cities within the state (Suburbs and Urban City). Each focus group lasted 90 minutes. Three focus groups were held in a community center in one city and the other three focus groups occurred in a church, apartment building, or senior center. After presenting the study information to focus group participants, written informed consent was obtained. Participants self-completed a brief 2–3-minute questionnaire collecting their sociodemographic and clinical characteristics information including age, gender, highest level of education completed, annual household income, and health insurance status as well as clinical characteristics such as self-reported health status, number of daily prescription medicines, number of chronic illnesses, and number of years of diabetes diagnosis. Open-ended focus group questions were developed to examine the study objectives (Supplementary material). All focus groups were audio-recorded and discussions were moderated by the primary investigator (a PhD trained AA with years of experience conducting focus groups), and a trained AA project assistant who helped to facilitate discussions and took notes. All data were collected in an iterative fashion, allowing the study investigators to continually refine the focus group questions, if necessary. Qualitative methodology approaches such as redirecting participants to the main topic if the discussion goes off track, engaging quiet participants, and preventing stronger participants from exerting control of the discussions were utilized during the focus groups.41 Participants were given $50 cash upon completion of the focus group. A certified professional transcriptionist transcribed all audio-recorded focus groups and the study project assistant corroborated all six transcripts with the audio files. Qualitative content analysis was used to analyze all transcribed data using NVivo 10 (QSR International-Melbourne) to organize and categorize the themes. Two research team members skilled in qualitative research analyzed the transcripts independently. In this analysis, an open coding system was used. To do this, the transcripts were initially read to develop a coding frame for the categories developed and then, the categories were conceptualized into themes.42 Subsequently, additional transcripts were read repeatedly to identify newer themes that might have been prompted during further focus group discussions. Themes were then explored across participant responses and focus groups to determine the relationships and comparisons. Data analysis continued until the researchers could not identify newer themes and dimensions within the data (data saturation).43,44 After all analyses were completed independently, all coders came together in a meeting to identify similarities and difference between themes and discuss any divergences. Agreement on all themes was reached before the results were interpreted. To ensure the accurateness of the analysis, the results of the study were mailed to four focus group participants who were selected based on their interest in other research-related activities, to examine if the information from the final analysis captured their experiences (member checking).45 Participants’ responses supported the validity of the results with no changes or additions recommended. Forty-eight patients were selected and agreed to participate in the study. There were 40 AA men and women who completed the study. Eight participants could not complete the study for logistical reasons such as bad weather and forgot the session. Majority of participants were female (61.4%), having a mean age of 53 years (±4.94), having a high school degree (28.2%) or college education (33.3%) as the highest level of education attained, and using at least seven prescription medications daily (7.18±6.21). The majority of participants self-reported a fair health status (43.6%) and a mean number of three chronic illnesses (2.9±1.8). Participants reported unintentionally and intentionally not taking their medicines. For unintentional nonadherence, few participants reported simply forgetting and used routines and reminders to remember to take them. Many participants reported intentionally not taking their medicines and their reasons were multifaceted and related to the following three themes: 1) perception of medicines; 2) perception of illness; and 3) access to medicines and information resources. The reasons for intentional nonadherence due to perception of medicines included concerns about the side effects of medicines and doubts regarding the effectiveness and safety of medicines. Participants were also fearful of taking medicines and frustrated about taking medicines for a long period. AAs reported concern about the side effects of prescription medicines. Participants were doubtful of the effectiveness of medicines. Participants expressed fear of taking medicines. Participants were frustrated and tired of taking medicines for a long period. Some participants did not intentionally take their medicines because of their perception of diabetes. For example, AAs reported that they did not believe they had diabetes, as the disease did not show any consequences. Some participants reported they did not take their medication if it was not physically available to them or their caregiver was unavailable to facilitate the use of medicines. Other participants expressed that the unavailability of resources to help with self-management, and a lack of knowledge about diabetes or how to ask provider questions hindered their ability to control diabetes through medications. On the other hand, some AAs reported taking their medications for various reasons including valuing being alive to perform their social and family roles, and belief in health care, for example, doctor recommendation and medication helpfulness. Medicines allowed participants do their job (social role) (Table 1). Medications prevented diabetes complications and death, circumstances that could disallow AAs from seeing their family (family purpose) (Table 1). Participants wanted to listen to the doctor. Some AAs believed that the medications helped to control diabetes. Participants provided solutions for enhancing medication adherence among AAs by focusing on the role of 1) providers, 2) patients, and 3) the church. Participants wanted health care providers to educate AAs about diabetes by focusing on the necessity of taking medicines and the consequences of not taking them (Table 2). Some participants wanted providers to use scare tactics with AAs to illustrate the seriousness of diabetes and its complications (Table 2). Others disagreed on the approach of scaring patients. Participants expressed the need for provider education on societal issues facing minority patients as well as working with other members of the health care team, and the community in providing care (Table 2). Participants expressed the need for AAs to support each other using buddy systems, teaching each other self-advocacy, and enhancing self-confidence in diabetes self-management (Table 2). Participants expressed the need for AAs to ask questions about diabetes and communicate with their providers about prescribed medicines (Table 2). Participants wanted the church to act as a health advocate in ensuring medication use by offering consistent help to AAs and presenting opportunities for the community to get information and resources (Table 2). To our knowledge, this is the first study to explore why AAs with type 2 diabetes may or may not take their diabetes medicines and their perceived solutions to addressing medication adherence. The study results showed that AAs mostly have intentional reasons for not taking their medicines based on their perception of medications, perception of illness because of disbelief of diabetes diagnosis, and access to medicines and information resources. On the other hand, participants who were adherent with their medications did so to engage in their social and family roles, and because they believed in the doctor’s treatment recommendation, and perceived the medication’s helpfulness. Participant perceptions of solutions for improving medication adherence focused on the roles of patients, health care providers, and the church. Our study findings compare differently to prior work. Najjar et al examined adherence among Palestinians and showed that patients with a higher level of knowledge about their medications were more adherent to their medications.46 In a study conducted in Italy, Napolitano et al showed that patients were more likely to adhere to medications if they had a college degree or higher level of education, took a lower number of total pills per day, and did not use pill organizers.10 In comparison, the current study further showed that AAs mostly had intentional reasons for not taking their medicines based on their perception of illness and medicines, and access issues. The differences between this study and prior work could be explained by the different methodologies used to collect data as well as cultural and geographical variations in participants and settings. The current study is a qualitative study and unique in that it aimed to qualitatively use focus groups to explore the reasons for adherence/nonadherence, hence providing rich and detailed information on adherence, compared to the use of surveys like prior studies. To be able to fulfill their social and family roles, the AAs in this study wanted to prevent diabetes complications, hospitalizations, and death, hence the reason for taking their medications. Consistent with these findings, in a prior study, AAs reported following their providers’ adherence recommendations because they wanted to live a long life, see their children and grandchildren, as well as prevent death.34 Some participants in this current study wanted a fear-based approach used in discussing the seriousness of the diabetes complications with AAs and health care providers educating AAs with diabetes by focusing on the necessity of taking medicines and the consequences of not taking them. Given the paucity of literature on AAs’ perception of ways of enhancing medication adherence, the study participant’s recommendation to focus education on medication necessity and the negative implications of nonadherence using a fear-based approach could be explored in tailored interventions to increase medication adherence among AAs with diabetes. Irrespective of the approach used, providers should emphasize the importance of medications in preventing complications among AAs while also interweaving positive reinforcements about living well and seeing grandchildren. AAs reported a lack of knowledge about diabetes and uncertainty regarding how to communicate or ask provider questions hindered their ability to control diabetes through medications. To enhance medication adherence among AAs, health care providers may also need to emphasize the meaning of diabetes and the consequences associated with poor control. A prior study showed that AAs already perceive that health care providers could enhance patients’ knowledge about medications.50 In this current study, some participants reported a belief in the doctor’s treatment recommendation and intended to listen to their recommendations because it was “common sense” to adhere to the provider’s advice. Literature shows that trust of physicians is a major factor that influences health care interactions among AAs.51,52 It is not unexpected that despite the well-known mistrust of health care providers by AAs,52 some participants still wanted to adhere to taking their medicines. Other studies have shown that AAs with diabetes may be motivated to prevent diabetes complications for functional reasons but may have no knowledge on how to prevent it.50 Efficient patient–provider communication that allows AAs with diabetes to freely ask provider questions may be lacking. In addition, if AAs do not trust their provider or believe that they are competent and caring,53 they may not readily ask questions. Orr Chlebowy et al recommended that one of the most important ways of improving diabetes outcomes among AAs is to identify ways of building patient trust while simultaneously empowering AAs to play active roles during their clinical encounter (eg, asking provider questions).50 All in all, it is possible that an underlying mistrust of providers, together with a lack of self-efficacy, led to the study participant’s uncertainty on how to ask provider questions, which subsequently led to their perception of a lack of tools to effectively control diabetes with medications. Collaborative patient–provider relationships are associated with better medication adherence among AAs with chronic diseases.54,55 AAs want to be involved in partnerships with their health care providers.47 However, for providers delivering care to AAs with diabetes, as shown in this study’s findings, developing a trusting relationship with the patient, the AA community, and caregivers also requires recognizing the societal barriers to controlling diabetes and adherence that AAs face. It is not surprising that the AAs in this current study were frustrated with taking medicines. A prior study reported that AAs are concerned about the time-consuming nature of diabetes and are frustrated with managing the disease because of how it controls their entire day.20 If AAs are frustrated with diabetes as a disease, they may also have trouble managing their medications, which may lead to frustration and fear of taking medicines because of confusions about the administration and uncertainty of what the side effects mean. To enhance medication use among AAs, health care providers, diabetes educators, and pharmacists need to pay attention to perceptions and beliefs about medicines, especially AAs’ emotional reactions to using medicines. Health care providers can provide connections to helpful resources that might help AAs with diabetes address the negative medication perceptions that come up during medication counseling and diabetes education. Participants in this study reported lack of available resources to help with diabetes self-management. There are many resources available to help patients improve diabetes self-management. However, navigating the health care system to access these available resources might be difficult for AAs, especially individuals with low health literacy who may have decreased ability to obtain, process, and comprehend health information.15,60 AAs with higher health literacy are more likely to have higher levels of confidence in managing health (self-efficacy), and more likely to adhere to their treatment.61,62 If self-efficacy is one of the most important psychosocial factors that affects medication adherence among AAs,61,63,64 then tailored health literacy-sensitive medication adherence interventions that focus on improving self-efficacy and enhance access to community resources are needed. The study results showed that AAs intentionally did not take their medication if it was not physically available to them or their caregiver was unavailable to facilitate the use of medicines. In a study of AAs with type 2 diabetes, support from family and peers (who may act as caregivers) was perceived as a major influence in enhancing medication adherence.65 AAs believe that family and friends can cue them toward taking action regarding medications by providing direct assistance (eg, picking up the medication), and reinforcing and encouraging positive medication-taking behaviors.50 Leveraging social support from family and community is an important consideration for enhancing adherence among AAs with diabetes. Participants indicated the need for AAs, their families, and the community to come together to support each other through support groups as well as teaching each other self-advocacy and enhancing self-confidence in diabetes self-management. Prior work shows that AAs are likely to be nonadherent because they perceive a lack of control over diabetes.50 Increasing social support and positive empowerment by including the social network of AAs (family, friends, and so on) in the management of medicines and diabetes is likely to improve AAs’ perception of control of diabetes and subsequently medication adherence. Community- and peer-based support interventions that build confidence and self-efficacy in diabetes management, and positively motivate and empower AAs to take action toward improving their health may improve medication nonadherence among AAs with diabetes. The strength of this study is that it qualitatively explored reasons for medication use behavior as well as medication adherence solutions from the experiential perspectives of AAs with diabetes. However, this study had several limitations. Possible recall bias among participants regarding their medication use is a limitation. The focus group questions were a subset of questions from the main focus group guide and may not have been well explored in-depth. The study findings were based on perceptions of AA middle-age adults with diabetes in one Midwestern US state. Reasons for medication adherence and nonadherence might differ by age group and regional location. Future studies will consider exploring these perceptions among other AA age groups and geographic locations. It is important to note that the sample size was 40 participants, which is consistent with the acceptable sample size in qualitative research. One third of the sample had some college education; thus, it is important to be cautious in explaining the findings among AAs from diverse socioeconomic status and education level. Future research can explore perceptions of adherence among a more diverse group of AAs, as barriers and facilitators might be different. Despite these limitations, the findings of this study can inform future research, as well as patient and provider education and training programs. AAs with type 2 diabetes have varying reasons for not taking their medicines, with most intentionally not adhering because of their perceptions of medicine and illness as well as a lack of access to medicines and information resources. Others take their medications because they value being alive to fulfill their family and social roles and because they believe in their doctor’s recommendation and medication helpfulness. Solutions for enhancing medication adherence should focus on the role of providers in educating patients on the necessity of medications in avoiding the consequences of diabetes complications, the role of patients in supporting and empowering one another in diabetes self-management, and the role of the church in being an advocate and communication avenue for diabetes self-management education. The authors would like to thank the study participants and the members of the community advisory board who endorsed this study. We also acknowledge the help of Pam Bracey who assisted with participant recruitment and data interpretation and Sin Chan who helped with the data analysis. This project is supported by the Clinical and Translational Science Award (CTSA) program, through the National Institutes of Health (NIH) National Center for Advancing Translational Sciences, grants UL1TR000427 and 5KL2TR000428. The content is solely the responsibility of the authors and does not necessarily represent the official views of the NIH. Hu D, Juarez DT, Yeboah M, Castillo TP. Interventions to increase medication adherence in African-American and Latino populations: a literature review. Hawaii J Med Public Health. 2014;73(1):11–18. Kelly JA, Kalichman SC. Behavioral research in HIV/AIDS primary and secondary prevention: recent advances and future directions. J Consult Clin Psychol. 2002;70(3):626–639. Haynes RB, Ackloo E, Sahota N, McDonald HP, Yao X. Interventions for enhancing medication adherence. Cochrane Database Syst Rev. 2008;2(2):CD000011. Balkrishnan R, Rajagopalan R, Camacho FT, Huston SA, Murray FT, Anderson RT. Predictors of medication adherence and associated health care costs in an older population with type 2 diabetes mellitus: a longitudinal cohort study. Clin Ther. 2003;25(11):2958–2971. Leventhal H, Nerenz DR, Purse J. Illness Representations and Coping with Health Threats. Hillsdale, NJ: Lawrence Erlbaum Associates; 1984. AHRQ. Better adherence to diabetes medications means fewer hospitalizations and emergency department visits; 2011. Available from: https://archive.ahrq.gov/news/newsletters/research-activities/mar11/0311RA8.html. Accessed March 13, 2017. Haynes RB, Taylor DW, Sackett DL. Compliance in Health Care. Baltimore, MD: Johns Hopkins University Press; 1979. Kuo SZ, Haftek M, Lai JC. Factors associated with medication non-adherence in patients with end-stage liver disease. Dig Dis Sci. 2017;62(2):543–549. Jackson IL, Adibe MO, Okonta MJ, Ukwe CV. Medication adherence in type 2 diabetes patients in Nigeria. Diabetes Technol Ther. 2015;17(6):398–404. Napolitano F, Napolitano P, Angelillo IF. Medication adherence among patients with chronic conditions in Italy. Eur J Public Health. 2016;26(1):48–52. Moradi-Lakeh M, El Bcheraoui C, Daoud F, et al. Medication use for chronic health conditions among adults in Saudi Arabia: findings from a national household survey. Pharmacoepidemiol Drug Saf. 2016;25(1):73–81. Krousel-Wood M, Islam T, Webber LS, Re R, Morisky DE, Muntner P. New medication adherence scale versus pharmacy fill rates in hypertensive seniors. Am J Manag Care. 2009;15(1):59. Heisler M, Faul JD, Hayward RA, Langa KM, Blaum C, Weir D. Mechanisms for racial and ethnic disparities in glycemic control in middle-aged and older Americans in the health and retirement study. Arch Intern Med. 2007;167(17):1853–1860. Shenolikar RA, Balkrishnan R, Camacho FT, Whitmire JT, Anderson RT. Race and medication adherence in Medicaid enrollees with type-2 diabetes. J Natl Med Assoc. 2006;98(7):1071. Trinacty CM, Adams AS, Soumerai SB, et al. Racial differences in long-term adherence to oral antidiabetic drug therapy: a longitudinal cohort study. BMC Health Serv Res. 2009;9(1):24. Kirk JK, D’Agostino RB, Bell RA, et al. Disparities in HbA1c levels between African-American and non-Hispanic white adults with diabetes. Diabetes Care. 2006;29(9):2130–2136. Kulik A, Shrank WH, Levin R, Choudhry NK. Adherence to statin therapy in elderly patients after hospitalization for coronary revascularization. Am J Cardiol. 2011;107(10):1409–1414. Patel I, Erickson SR, Caldwell CH, et al. Predictors of medication adherence and persistence in Medicaid enrollees with developmental disabilities and type 2 diabetes. Re Social Adm Pharm. 2016;12(4):592–603. Trinacty CM, Adams AS, Soumerai SB, et al. Racial differences in long-term self-monitoring practice among newly drug-treated diabetes patients in an HMO. J Gen Intern Med. 2007;22(11):1506–1513. Hill-Briggs F, Gary TL, Bone LR, Hill MN, Levine DM, Brancati FL. Medication adherence and diabetes control in urban African Americans with type 2 diabetes. Health Psychol. 2005;24(4):349. Adams AS, Zhang F, Mah C, et al. Race differences in long-term diabetes management in an HMO. Diabetes Care. 2005;28(12):2844–2849. Schectman JM, Nadkarni MM, Voss JD. The association between diabetes metabolic control and drug adherence in an indigent population. Diabetes Care. 2002;25(6):1015–1021. Brown MT, Bussell JK. Medication adherence: WHO cares? Mayo Clin Proc. 2011;86(4):304–314. Kripalani S, Henderson LE, Jacobson TA, Vaccarino V. Medication use among inner-city patients after hospital discharge: patient-reported barriers and solutions. Mayo Clin Proc. 2008;83(5):529–535. Raynor DT. Medication literacy is a 2-way street. Mayo Clin Proc. 2008;83(5):520–522. Wolf MS, Gazmararian JA, Baker DW. Health literacy and functional health status among older adults. Arch Intern Med. 2005;165(17):1946–1952. Ryan AA. Medication compliance and older people: a review of the literature. Int J Nurs Stud. 1999;36(2):153–162. Fleck DE, Keck PE Jr, Corey KB, Strakowski SM. Factors associated with medication adherence in African American and white patients with bipolar disorder. J Clin Psychiatry. 2005;66(5):646–652. Kronish IM, Leventhal H, Horowitz CR. Understanding minority patients’ beliefs about hypertension to reduce gaps in communication between patients and clinicians. J Clin Hypertens. 2012;14(1):38–44. Ogedegbe G, Harrison M, Robbins L, Mancuso CA, Allegrante JP. 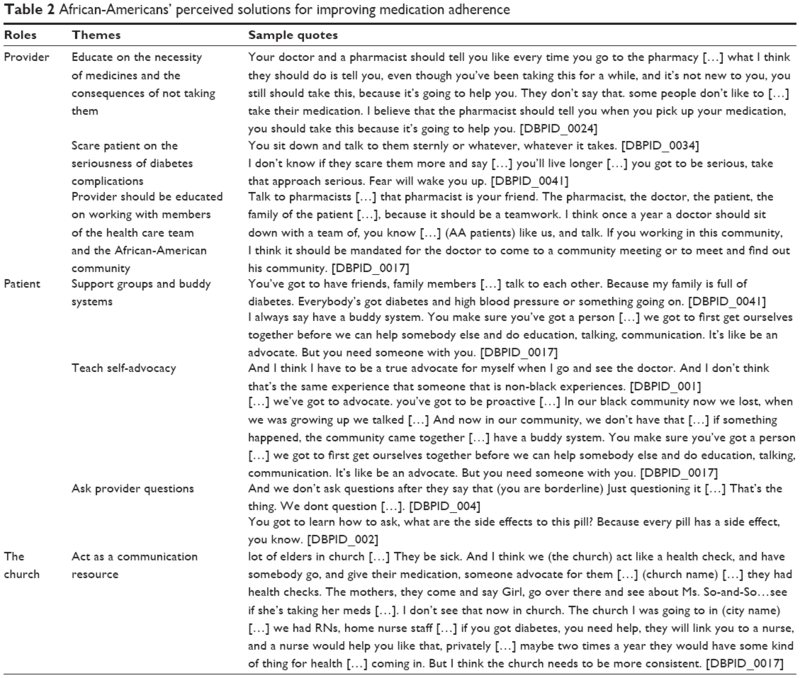 Barriers and facilitators of medication adherence in hypertensive African Americans: a qualitative study. Ethn Dis. 2003;14(1):3–12. Buckley L, Labonville S, Barr J. A systematic review of beliefs about hypertension and its treatment among African Americans. Curr Hypertens Rep. 2016;18(7):1–9. Fongwa MN, Evangelista LS, Hays RD, et al. Adherence treatment factors in hypertensive African American women. Vasc Health Risk Manag. 2008;4(1):157. Lukoschek P. African Americans’ beliefs and attitudes regarding hypertension and its treatment: a qualitative study. J Health Care Poor Underserved. 2003;14(4):566–587. George M, Freedman TG, Norfleet AL, Feldman HI, Apter AJ. Qualitative research-enhanced understanding of patients’ beliefs: results of focus groups with low-income, urban, African American adults with asthma. J Allergy Clin Immunol. 2003;111(5):967–973. Pope C, Ziebland S, Mays N. Qualitative research in health care: analysing qualitative data. BMJ. 2000;320(7227):114. Morgan DL, Krueger RA. When to use focus groups and why. In: Morgan DL, editor. Successful Focus Groups. London: Sage; 1993. Ward EC, Mengesha M, Issa F. Older African American women’s lived experiences with depression and coping behaviours. J Psychiatr Ment Health Nurs. 2014;21(1):46–59. Fontana A, Frey J. The art of science. In: Denzin N, Lincoln Y, editors. The Handbook of Qualitative Research. Thousand Oaks, CA: Sage Publication, Inc.; 1994:361–376. Thomas DR. A general inductive approach for analyzing qualitative evaluation data. Am J Eval. 2006;27(2):237–246. Charmaz K, Belgrave L. Qualitative interviewing and grounded theory analysis. In: The SAGE Handbook of Interview Research: The Complexity of the Craft. 2002;2:347–365. Richards L. Handling Qualitative Data: An Introduction. Thousand Oaks, CA: Sage; 2006. Birt L, Scott S, Cavers D, Campbell C, Walter F. Member checking a tool to enhance trustworthiness or merely a nod to validation? Qual Health Res. Epub 2016 Jun 22. Najjar A, Amro Y, Kitaneh I, et al. Knowledge and adherence to medications among palestinian geriatrics living with chronic diseases in the west bank and east Jerusalem. PLoS One. 2015;10(6):e0129240. Mosley–Williams A, Lumley MA, Gillis M, Leisen J, Guice D. Barriers to treatment adherence among African American and white women with systemic lupus erythematosus. Arthritis Rheum. 2002;47(6):630–638. Mann DM, Ponieman D, Leventhal H, Halm EA. Predictors of adherence to diabetes medications: the role of disease and medication beliefs. J Behav Med. 2009;32(3):278–284. Krauskopf K, Federman AD, Kale MS, et al. Chronic obstructive pulmonary disease illness and medication beliefs are associated with medication adherence. COPD. 2015;12(2):151–164. Orr Chlebowy D, Hood S, LaJoie AS. Facilitators and barriers to self-management of type 2 diabetes among urban African American adults. Diabetes Educ. 2010;36(6):897–905. Cuffee YL, Hargraves JL, Rosal M, et al. Reported racial discrimination, trust in physicians, and medication adherence among inner-city African Americans with hypertension. Am J Public Health. 2013;103(11):e55–e62. Hammond WP. Psychosocial correlates of medical mistrust among African American men. Am J Community Psychol. 2010;45(1–2):87–106. Musa D, Schulz R, Harris R, Silverman M, Thomas SB. Trust in the health care system and the use of preventive health services by older black and white adults. Am J Public Health. 2009;99(7):1293–1299. Schoenthaler A, Chaplin WF, Allegrante JP, et al. Provider communication effects medication adherence in hypertensive African Americans. Patient Educ Couns. 2009;75(2):185–191. Schoenthaler AM, Butler M, Chaplin W, Tobin J, Ogedegbe G. Predictors of changes in medication adherence in blacks with hypertension: moving beyond cross-sectional data. Ann Behav Med. 2016;50(5):642–652. Shiyanbola OO, Nelson J. Illness perceptions, beliefs in medicine and medication non-adherence among South Dakota minority women with diabetes: a pilot study. S D Med. 2011;64(10):365–368. Abubakari AR, Jones MC, Lauder W, Kirk A, Anderson J, Devendra D. Associations between knowledge, illness perceptions, self–management and metabolic control of type 2 diabetes among African and European–origin patients. J Nurs Healthc Chronic Illn. 2011;3(3):245–256. Broadbent E, Donkin L, Stroh JC. Illness and treatment perceptions are associated with adherence to medications, diet, and exercise in diabetic patients. Diabetes Care. 2011;34(2):338–340. Lewis TT, Barnes LL, Bienias JL, Lackland DT, Evans DA, De Leon CFM. Perceived discrimination and blood pressure in older African American and white adults. J Gerontol A Biol Sci Med Sci. 2009;64(9):1002–1008. Schillinger D, Grumbach K, Piette J, et al. Association of health literacy with diabetes outcomes. JAMA. 2002;288(4):475–482. Sarkar U, Fisher L, Schillinger D. Is self-efficacy associated with diabetes self-management across race/ethnicity and health literacy? Diabetes Care. 2006;29(4):823–829. McCleary-Jones V. Health literacy and its association with diabetes knowledge, self-efficacy and disease self-management among African Americans with diabetes mellitus. ABNF J. 2011;22(2):25–32. Tovar EG, Dekker RL, Chung ML, et al. Self-efficacy mediates the relationship of depressive symptoms and social support with adherence in patients with heart failure. J Health Psychol. Epub 2015 May 18. Rust CF, Davis C, Moore MR. Medication adherence skills training for African-American breast cancer survivors: the effects on health literacy, medication adherence, and self-efficacy. Soc Work Health Care. 2015;54(1):33–46. Tang TS, Brown MB, Funnell MM, Anderson RM. Social support, quality of life, and self-care behaviors among African Americans with type 2 diabetes. Diabetes Educ. 2008;34(2):266–276. Ward EC, Wiltshire JC, Detry MA, Brown RL. African American men and women’s attitude toward mental illness, perceptions of stigma, and preferred coping behaviors. Nurs Res. 2013;62(3):185–194. Abrums M. “Jesus will fix it after awhile”: meanings and health. Soc Sci Med. 2000;50(1):89–105. There are several ways to treat diabetes. One way is to use prescription medications. What do you think about using prescription medications to treat diabetes? People do not take their medications for many reasons. What are some reasons why you might not take your diabetes medication? When doctors prescribe a medication, they want people to take that medication exactly “as directed.” However, we know that does not always happen. What do you think health professionals can do to make it more likely that patients will take their medications as directed? Given your experiences, what do you believe can help people take their medicines appropriately (as directed by their doctor)? How can we help patients who do not want to take medications at all?